This month’s theme with Kitchen Play, a virtual progressive dinner among bloggers and brands, is potatoes. I was asked to create an original main dish recipe that utilized 2 types of potatoes. 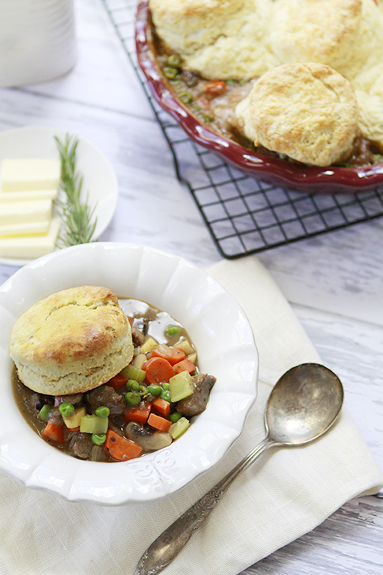 Remember the other week when I teased you about a Biscuit Topped Beef and Vegetable Pot Pie recipe when I shared my Rosemary Potato Buttermilk Biscuits? That is what this recipe was for! I’m so excited to finally share it with you. We’ve eaten this delicious Beef Pot Pie a few times over the last month and enjoyed it so much. For this recipe, the two types of potatoes that I used are Russets and Red Potatoes. Red potatoes are great for the filling because they hold their shape well, while russets add to the wonderful tenderness of the Rosemary Potato Buttermilk Biscuits. If you’re wondering about what the different types of potatoes are good for and what makes them different, here is some helpful information. Yellow potatoes offer golden skin and flesh. Grilling these potatoes enhances their slightly sweet, caramelized flavor. The flesh is smooth with a buttery texture that is well suited towards lighter baked or roasted potato recipes. White potatoes are known for their creamy tenderness. Consider white potatoes an “all-purpose” type. They do well with mashed recipes do to their slightly dense flesh with creamy texture. Because their skins are delicate and thin, the potatoes don’t necessarily need to be peeled before preparing for mashed potatoes. They also hold their shapes well in soup or stew recipes. When you think of a potato, the russet type is probably what comes to mind – they’re the most commonly used potato in the United States and feature a brown skin with white flesh. 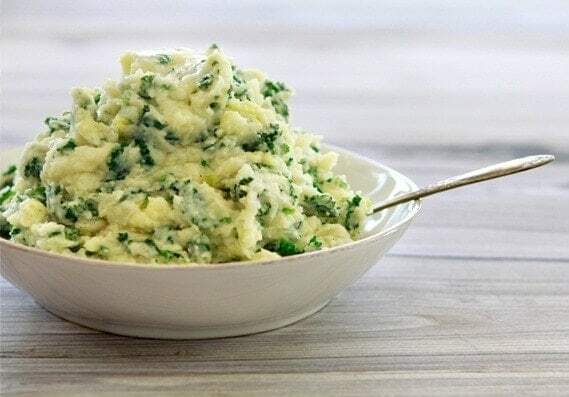 The flesh is light and fluffy with a somewhat grainy texture, making russets ideal for recipes like Mascarpone Chive Mashed Potatoes and Perfect Baked Potatoes as well as the traditional crispy, pan-fried potato. We love petite, “bite-sized” potatoes in our house. Because they’re so small, they don’t require any cutting and cook quickly. The petite versions offer the same color, flavor, and texture characteristics as their full-sized counterparts. They are available in red, white, yellow, brown and purple. Try them in potato salads or as a roasted potato side dish. Fingerlings are another fun potato type. As the name implies, they are shaped like fingers and range from 2 to 4 inches in length (points with the kids for the fun food name!). Rather than possessing similar texture characteristics to their larger counterparts like petites, fingerlings typically offer a firm, waxy texture. The flavor can be described as nutty or buttery. Try them pan-fried or roasted. Fingerlings, like petites, are also available in a variety of colors: red, orange, purple, yellow and white. Purple potatoes are just that…purple – inside and out! Purple potatoes retain their shape well due to their moist, firm flesh. They add a burst of color to salads (think Red, White & Blue potato salad for the 4th of July) and possess a mild, nutty flavor. The flavors are complimented well with green salads and are enhanced with roasting. Red potatoes are identified by a rosy red skin and a moist, waxy white flesh. These potatoes stay firm throughout cooking, which makes them ideal for potato salads, soups & stews, and roasting (we also like them grilled in a foil packed with fresh rosemary in the summer). They taste slightly sweet and are tender. Leave the skin on for added color to a dish. What is your favorite potato type? 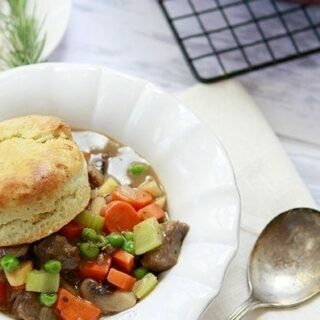 Tender beef and lots of vegetables topped with a delicious soft rosemary potato buttermilk biscuit crust. In a large cast iron skillet or pan, heat the olive oil. Add the beef, season with salt and pepper and cook over medium-high heat until it is browned on all sides. Remove and set aside on a plate. Add onion to the pan, adding additional oil as necessary, and saute until tender - about 5 minutes. Add the mushrooms and saute for an additional 5 minutes. Return beef to the pan and add the red wine to deglaze, taking care to scrape up any browned bits on the bottom of the pan as they offer a lot of flavor. Cover and cook over low heat for 30-40 minutes, or until beef is tender (optional: use a pressure cooker on high pressure for 10 minutes). Meanwhile, prepare the sauce. In a medium saucepan, add the butter and melt. Whisk in the flour. Then whisk in the milk and broth. Bring to a boil and simmer until thickened, about 5 minutes. Set aside. Uncover and add the carrots, celery, potatoes and parsnips. Cook for 5 minutes. Add the peas. Stir in the sauce. Pour ingredients into a large casserole dish and top with the uncooked biscuits. Bake in a 400 degree preheated oven for 35 minutes. Cool 5 minutes before serving. Remove the flesh from the baked potatoes. Mash it with a fork or press it through a potato ricer. This will take 1 - 2 potatoes and should result in a total of 1/2 cup of potato. In a small mixing bowl, combine the 1/2 cup potato with the buttermilk. Whisk until smooth and set aside. In a medium bowl, combine the all-purpose or spelt flour, cake flour, sugar, baking powder, baking soda, and salt. Whisk until well sifted. Cut the butter into the flour mixture either using two knives, a pastry blender, or a cheese grater. I prefer to use the cheese grater and grate frozen butter into the flour mixture. Add the rosemary and stir to combine. Make a well in the center of the flour mixture and add the buttermilk potato mixture. Stir until combined, and then when you can't stir it anymore, turn it out onto a lightly floured surface and gently knead until you can form a rough ball. Flatten the dough into a circle about 1/2 - 3/4 inch in thickness. Using a biscuit cutter or a drinking glass (about 2 1/2 - 3" in diameter for the listed baking time) turned upside down, cut as many rounds as you can. Using the dough scraps, form another circle of the same thickness. Repeat cutting until you have used all the dough. 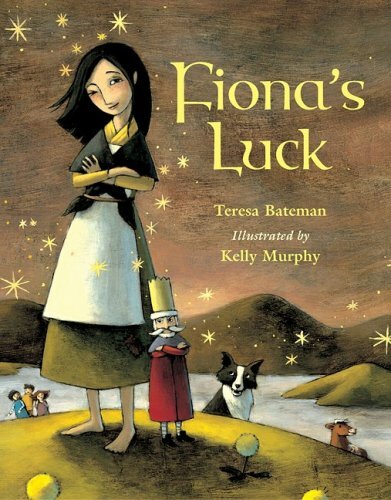 The US Potato Board is also sponsoring a wonderful giveaway over at Kitchen PLAY. 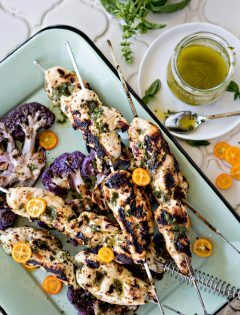 Recreate any one recipe from this month’s Progressive Party, post about the experience on your blog and provide a link to your post on Kitchen PLAY to enter. ll qualifying bloggers in each course will be entered to win $100 (6 prizes total). Submission deadline is April 15, 2012. Be sure to check out the contest rules before entering. For more information on the nutritional benefits of potatoes, visit the US Potato Board’s Website or visit their Facebook Page. 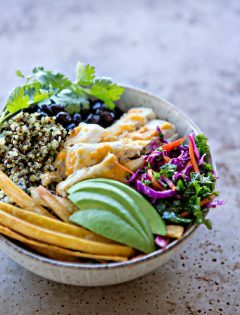 I have written this post and shared this recipe as part of my participation in the Potato Progressive Party campaign in partnership with Kitchen Play and US Potato Board. I have been compensated for my time and cooking expenses but my opinions and tastes are my own. I like red potatoes best! I love that I don’t have to peel them and they look so pretty when they’re cooked. Can’t wait to try these recipes. This pot pie ounds delicious especially with that rosemary biscuit crust! I love pot pie and I love the sound of the rosemary biscuit! Oh, that pot pie sounds absolutely amazing! What a scrumptious dinner!